Vikings, lust and revenge collide! A rich tale of power and forbidden love revolving around a young medieval queen. In 1002, fifteen­-year-old Emma of Normandy crosses the Narrow Sea to wed the much older King Æthelred of England, whom she meets for the first time at the church door. Thrust into an unfamiliar and treacherous court, with a husband who mistrusts her, stepsons who resent her and a bewitching rival who covets her crown, Emma must defend herself against her enemies and secure her status as queen by bearing a son. "...God's hand was at work in every action, and death was never more than a whisper away". This novel starts off with fabulous spine-tingling drama that signals the struggles to come between families battling for royal status. Emma from Normandy gets shipped off to England to marry King Æthelred, the king who already has a quiver full of sons eyeing the crown. Emma's reception at court is less than welcoming, and Emma finds herself alone in a strange land where no one trusts her and her Norman ways. The Danes are striking at their lands, and the marriage of Emma to England was supposed to thwart some of these attacks, but it seems to be just the opposite as the Danes attack again and again. "She had to remember who she was and why she had been chosen for this task. If she allowed her fear to overcome her, she would fail her child. She could not do that again." On top of political disasters and Viking raids, Emma's found herself facing a conniving rival at court. Elgiva and her family dislike Emma's role as Queen, as Elgiva has designs on the throne for herself. However, since women were mere pawns/chattel/baby makers in the scheme of the High Middle Ages there is little that Elgiva can do, except resort to drastic measures, and her treachery wreaks havoc on Emma. Perpetuating the let's be cruel to women theme, King Æthelred was a character we could almost empathize with because of his off the charts stubborn dimwittedness, but then it's full-on dislike for him in the next chapter. Add in the strapping princes and the author has given us a story of betrayal, lust, greed, revenge and good old fashioned story-telling. But it is still that same old story in England of who's going to be the next King that seems to gnaw on everyone's minds till the kingdom was finally united eons later.. but it's the characters that draw you in, and their plights, and their struggle to birth male babies.. and the author weaves us a tale from her imagination based on the few facts at her fingertips, largely based on Anglo-Saxon Chronicles. I loved how she added in the evil omens and the shadows of the murdered king- those are some things that turn serious readers off, but I liked the story she spun with them. I am thinking that the readers who do not like Philippa Gregory will possibly not like this one. Before the Plantagenets, before the many Richards and Henrys asserted their rights for the throne of England, there was King Æthelred's own sons who wondered who would come next. Emma of Normandy and the era are new to me, so I was intrigued throughout most of the novel. Those readers new to the era will delight as much as I have with this fight-for-your-right story, although those looking for something along the lines of rich with historical details and a slew of historical names may not appreciate this one. I did still enjoy it, and I feel it is a wonderful introduction to the era and to Emma. 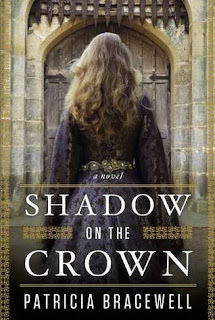 Through her lightly descriptive prose debut author Patricia Bracewell gives us a glimpse of the times from paganism to Christians and the unrest between Normandy and England, and the unrest of those too close to the crown for comfort. The writing and the political dramas were done well enough that I read this one pretty quickly, and I do recommend it to others also interested in learning more about Emma's life. My two complaints: The use of the C Word that was used a few times will offend some, and I can hardly remember the last time I'd seen it in a book, so I think they should have taken it out. Those people wanting a full on saga type feel will begin to realize that the rest of the story is being saved for later. So the second complaint is I wish I knew this was a trilogy from the onset, because while reading I was waiting for certain things to happen, and I think that distracted me towards the last half of this story. There is zero mention of a trilogy or series or anything along those lines anywhere on this hardcover. It wasn't till later that I realized it was a trilogy, so the ending as a whole still had me waiting to see Emma's story play out and I wish I could dig into it. But I'll have to wait a year, and I'm an impatient woman. And as for book three in the trilogy that is not a trilogy -- as of February 18 2018 the author is 400 pages/36 pages into writing book 3. Visit HF-Connection to view some informative images related to the book.